Tish had been begging me for months to watch New Girl, and once I finally did? Well, I wondered why it took me so long to tune in. The show is huh-larious. And my hands-down favorite character? Schmidt. I’m sure this says something incredibly and deeply disturbing about my subconscious, but I think he’s cute. Like really cute. Like I totally have a crush on him, even though he’s usually (okay, mostly) a d-bag. So, when Tish found the below video—Schmidt’s Workout Video—I drooled, laughed and then watched it again. And again. 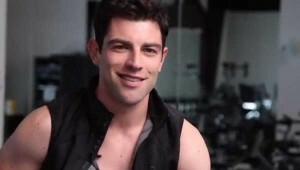 I’d sooo go to Schmidt’s Spin class. (And be the only one.) Yes, I’d cringe at the overly enthusiastic cuing and his inability to use the word “treble,” but I’d probably be smiling right along with him. So, yes. It’s on. Let’s do this! YES! I am SO pumped you posted this!!! Why must this be my fiance…TO A T!? LMAO! I love this! Schmidt is an awesome character. I would so take his spin class! Thanks for the post!